I love living in Bali, but one thing I do not care for is all the waste here and the lack of a waste management system or even a recycling system. You see trash everywhere you go in Bali now. 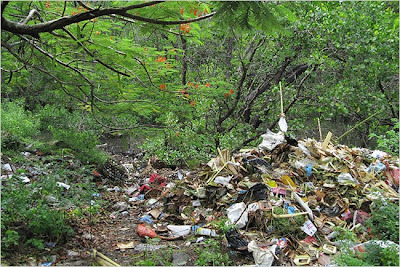 Trash on the streets, in the greenery, along the beach...the rivers are even filling up with it. Everywhere you go, plastic bags are used and then later thrown to the wind to fall in the streets, roadsides, water drains and hanging from the trees!! A few months ago, we all went to one of the best beach spots for relaxing, smooth waves, in Nusa Dua and I pulled out several large plastic bags from the clear blue water that, I assume, had been discarded by the fisherman/seaweed crew that work in the water on floats not far from where everyone swims. It is just so sad and depressing to see. Pollution is also becoming a major problem in Bali, but more on that in a future post.